Wellington, New Zealand, is proud of its boutique destination feel, its friendly, down-to-earth people and its “coolest little capital in the world” nickname. The city’s few international flights (thanks to the airport’s relatively short runway) mean that easier-to-access cities like Auckland and Christchurch are often the default international gateways for travelers, particularly those coming from the US. But wonderful Wellington is ideal for tourists. I’ve been coming here since 2010 and I love discovering how much the city has changed, chilling out with relaxed Kiwi mates, sampling all the latest wines and beers and soaking up some sun in the gorgeous, temperate climate. Getting around the city is easy too, thanks to Uber and a decent bus network that’s Google Maps-enabled. Here are 10 reasons why you should consider making Wellington your base on a trip to New Zealand. Okay, first things first: how do you get here, and why is it handy? Qantas, Virgin Australia, Air New Zealand and Jetstar all fly to Wellington from several Australian locations in about about four hours, while Air New Zealand and Jetstar will connect you from Auckland, Christchurch or Queenstown in about an hour. Fiji Airways also flies to Wellington from Nadi, which is a decent option for travelers from the west coast of the US who might like to stop off for some tropical fun in Fiji. Note that Air New Zealand has a four-product economy class ancillary price structure to Australia, yet no business class options. Cheaper fares can usually be had by searching and selecting through the New Zealand version of the Air New Zealand site, where you can also mix and match open-jaw tickets without any one-way fare penalties. Sunset over Cook Strait is a glorious thing to behold on an approach into Wellington. Image by the author. Internally, Air New Zealand has the best network and Star Alliance Gold members shouldn’t miss Wellington’s domestic Air NZ Koru Lounge, which offers awesome views over the runway, barista-served coffee, delicious snacks and displays of aircraft models. Qantas’ low-cost carrier, Jetstar, also flies to Auckland, Christchurch and Queenstown from Wellington — Oneworld frequent flyers can earn points on those flights, although no Oneworld domestic lounges are available at the airport. The short runway at WLG means widebodies aren’t flown to Wellington. Image by the author. Wellington is also far superior to Auckland for connecting between domestic and international flights, since it’s all in one terminal — AKL’s domestic and international terminals are a good 15 minutes apart by outdoor footpath or transfer bus. Plus, it’s located in the middle of the country, which means you have less time to spend on barebones all-economy domestic flights. The best part: you can get pretty much anywhere in New Zealand within about an hour’s flight from Wellington. Wellington Airport’s position is the best place for an airport in the region, but poses expansion challenges. Image by the author. First thing: coffee. Wellington didn’t invent great coffee, but it might as well have. The city certainly claims the flat white for itself, and the fact that there are only two Starbucks locations in the city means that pretty much anywhere you walk into, you’ll get a great cup of coffee. Serious coffee drinkers like serious baked goods too — and some that aren’t so serious. Anyone with a sweet tooth should try Kiwiana specialties like lolly cakes, pikelets, jelly slices, lamingtons, Anzac biscuits or anything featuring the local feijoa fruit. For something a little more savory, try New Zealand’s sausage rolls, cheese rolls or a pie. When Portlanders come to the Craft Beer Capital and swoon over the beer, you know it’s good. There are two sections of the Craft Beer Trail that feature an insanely great range of brews, and if you manage to walk stumble your way through it, you get to bring home some great swag — as well as a great hangover. 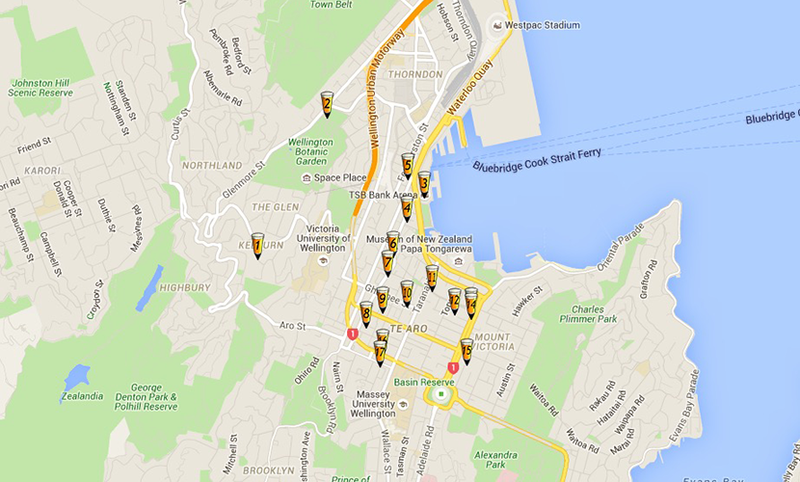 Wellington’s Craft Beer Trail will please your palate. The bad news is Wellington sits on a strike-slip seismic fault, meaning earthquakes are not uncommon. The good news is Kiwis take earthquake strengthening pretty seriously, and the striking hills around the city that result from all this geological activity provide an absolutely gorgeous backdrop. Walk up craggy Mount Victoria for one of the best views over the city — stop by The Chippery on Majoribanks Street for Welly’s best “fush and chups” on your way back down — or for a more leisurely pace, take the famous funicular from Lambton Quay up to Kelburn and walk down through the botanical garden. But you don’t need to hike up a mountain to get gorgeous views of Wellington Harbour — and, on a clear day, all the way to the South Island. Many of Wellington’s suburbs have seaside cafés that are great places to grab a snack while you enjoy the view. The Maranui is a local fave in surfer hangout Lyall Bay near the airport, while the Spruce Goose is actually converted from the old domestic terminal. The Bach — Kiwi slang for a rural holiday home, pronounced “batch” — sits on the south coast and offers clear views over Cook Strait to the mountains of the South Island, while Scorch-o-Rama sits on fantastically named Scorching Bay, looking out to the other side of the harbor. From “The Bach” you can see the South Island’s mountains on a clear day. Image by the author. Part-pedestrianized Cuba Street is Wellington’s shopping mecca, with all kinds of stores offering a dizzying array of things to pop in your suitcase. Don’t miss Japan City if you’re a Japanophile — you’ll find all kinds of goodies not seen this side of Tokyo. The Miramar Peninsula is also home to “Wellywood,” New Zealand’s film mecca. Image by the author. The Te Aro area around Cuba Street is also the most accessible way to dip your toe into Wellington’s impressive foodie scene. My recommendations: breakfast at Espressoholic, another brew at Flight Coffee’s Hangar, brunch at Fidel’s, Argentinian meat feasts at El Matador and dinner at Wellington’s best restaurant, Logan Brown (try the paua ravioli, made from local abalone). If you’re still not stuffed by then, take a stroll through the cheese room at Moore Wilsons, Wellington’s boutique supermarket, grab some artisanal bread and make yourself a light snack. 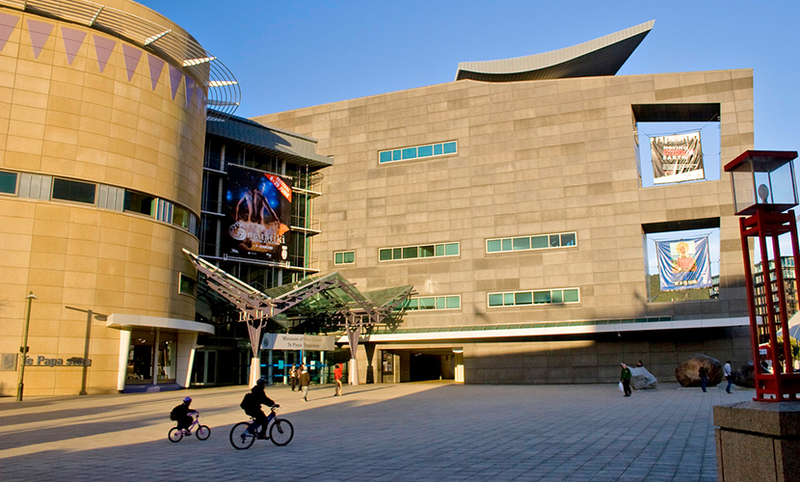 Wellington’s — and New Zealand’s — masterpiece museum deserves a mention in its own right. With a fascinating mix of collections, plus special exhibitions (and, being Wellington, a great café) it’s great anytime, but particularly on a rainy day — don’t miss the famous colossal squid. The Te Papa Tongarewa Museum of New Zealand, one of the highlights of any trip to Wellington. Image courtesy of Wikimedia Commons. Wellington’s weather is famously exciting — they don’t call it the “Roaring Forties” for nothing. But its geographical position (exactly on the other side of the world from Northern Spain) and the effects of the Tasman Sea meeting the Pacific Ocean mean that windy Wellington’s weather is never boring. Winters are mostly mild and wet (like Seattle) while summers are warm (about 70-80 degrees) and the wind blows any pollution away faster than a tourist’s umbrella. It’s certainly no sweltering swamp like Australia’s prime tourist destinations can be in the summer. On a warm day in Wellington, the city’s beaches come alive with sun kissed New Zealanders soaking up the rays — less than an hour’s drive from the city, you’ll find deserted wild beaches at Makara and along the scenic Wainuiomata Coast. Sunny, sandy Oriental Bay is a gem. Image by the author. But if it’s raining, New Zealand’s cultural capital status is another great option. I’ll certainly never forget watching a performance of The Rocky Horror Show (the stage version) with creator Richard O’Brien playing the Narrator, nor several of the New Zealand Opera productions I’ve enjoyed. Wellington is well served by wine shops where you can taste your way through some of the wine Kiwis like to keep for themselves, but if you want to sample some hyperlocal varietals, head over the hill to Martinborough and the Wairarapa region. The microclimate on the other side of the stunning Rimutaka range that makes such great wine — try the Pinot Noir in particular — also means that if Wellington is having one of its wet days, the Wairarapa region might well be sunny and hot. Opt for an excursion from Wellington via train or appoint a designated driver and take a ride over the twisty and faintly terrifying Rimutaka Hill Road — just remember to drive on the left side (like in the UK) and if you’re not comfortable with a manual/stick-shift/standard transmission, book an automatic vehicle ahead of time instead. What are your favorite things to do in Wellington, New Zealand? Let us know, below.